One of the advantages of working at the the Steinhart Aquarium in the California Academy of Sciences has is being able to care for, and observe so many different animals that we might not be exposed to anywhere but a public aquarium. 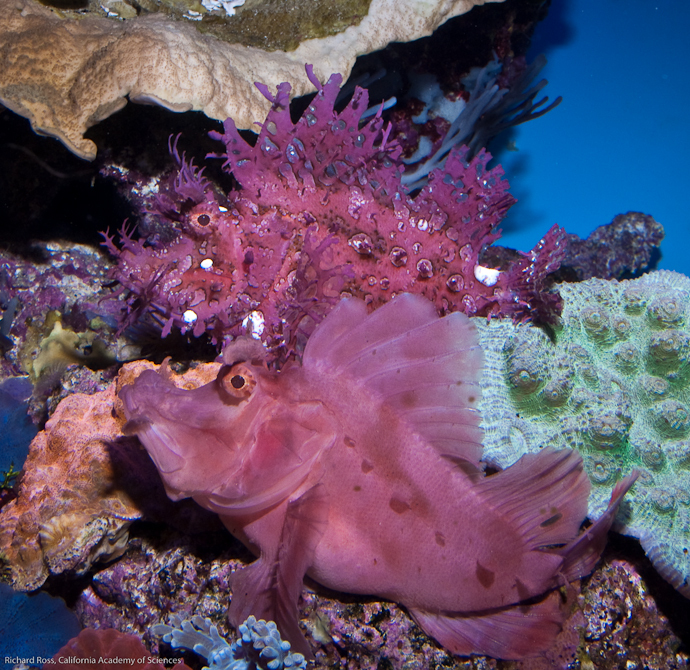 For instance, we display not one, but two Rhinopias Scorpion fish. These venomous fish are not overly abundant in the industry or the wild, and they don’t have the best track record in captivity, often living for less than two years and then dying mysteriously. We thought very hard before committing to putting them on display, and decided we would give it a go when two of them, a Rhinopias eschmeyeri and a Rhinopias frondosa (though there is some debate as to their being different species), became available last November. Since going on display they have been eating well, shedding regularly (normal behavior) and challenging guests to spot them among the corals.Even though we have been thrilled at our success with these fish so far, we never expected to find what we found in the tank a week and a half ago – an egg raft. The eggs were hard to spot, being almost completely clear, and they may mimic a comb jelly to prevent predation. Apparently these are the first Rhinopias eggs that have been laid in captivity. We assumed the eggs were infertile, but were surprised to see development on the day after discovery, and even more surprised when they hatched. At the time of writing, we have collected two batches of eggs and larvae are still alive after 8 days. It has been amazing to watch the larvae develop through the microscope, growing fins, a mouth and a gut where none existed before.Raising larval marine fish is tough, so every day they survive we are thrilled, and, though we aren’t done with this batch yet, we hope that we can build on this experience so that if more eggs are produced we have a better chance of getting them through the larval stage. Special thanks to Matt Wandell, Matt Pederson, Frank Marini, Andrew Berry, Gresham Hendee and Reef Nutrition for their support and advice through this ongoing process.